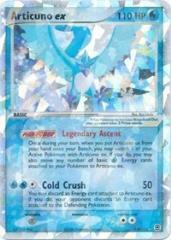 Once during your turn, when you put Articuno ex from your hand onto your Bench, you may switch 1 of your Active Pokemon with Articuno ex. If you do, you may also move any number of basic Water Energy cards attached to your Pokemon to Articuno ex. You may discard an Energy card attached to Articuno ex. If you do, your opponent discards an Energy card attached to the Defending Pokemon.